We create fun and engaging digital promotions to for listeners to participate. Our sponsored promotions create hundreds of leads for your business to engage with. We create a strategy to collect usable data to meet your goals and and ensure a successful promotion. This database is yours to use as your business needs. Through our digital promotions, we have the ability to help generate quality foot traffic directly to your business. Case Study: What Kind of Hunter Are You? 54 Archery wanted to create some buzz and get people excited for hunting season. Partnering with our rock station KCMQ, 54 Archery sponsored a “What Kind of Hunter Are You?” quiz, with the winner receiving a Bowtech Fuel Bow just in time for hunting season. With the help of KCMQ and www.kcmq.com, the promotion received 541 total entries, and 441 email opt-ins for 54 Archery. In addition to giving away an incredible prize, the promotion generated over 441 leads for Goodwill. Country Financial wanted to get people excited for football season while creating some awareness for their insurance. Partnering with our classic country station KATI, Country Financial sponsored a football trivia quiz, with the winner receiving a $400 Visa Gift Card. With the help of KAT and www.kat943.com, the promotion received 217 total entries, and 122 email opt-ins for Country Financial – leads they could then market their insurance policies to. Christmas can be expensive. 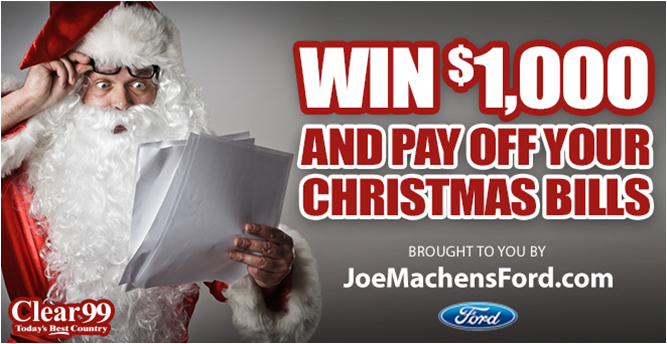 Joe Machens knows this, so they wanted to give one lucky Clear 99 listener a chance to win $1,000 to pay off the Christmas bill. Not only did Machens pay the Christmas bill, but over 1,900 people signed up who opted in to receive more information from Machens. To celebrate The Eagle’s 15th Birthday on-air, we wanted to give one lucky couple the trip of a lifetime to New York City with hotel, airfare, and a trip to the 9/11 Memorial included. Because the majority of Eagle listeners are working homeowners and Columbia residents, TrueSon Exteriors hopped on board to sponsor the giveaway. In total, the promotion generated over 745 entries and 438 leads for TrueSon Exteriors. Moberly Area Community College wanted to run a promotion to help recruit students and individuals looking to go back to school. 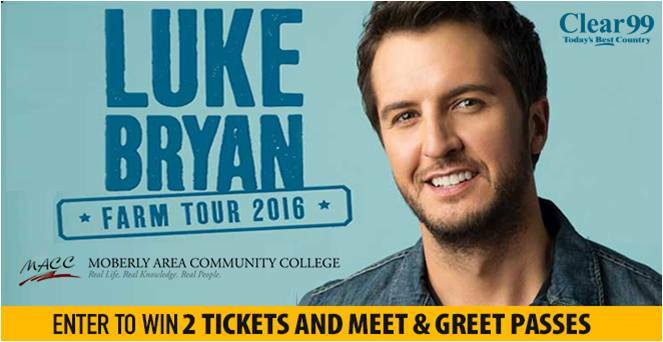 Partnering with Clear 99, MACC ran a giveaway for Luke Bryan tickets to his Centralia Farm Tour show. To help with their recruitment, we asked all entries a few survey questions about their career path and if they were looking to go back to school. Based on their response, MACC was then able to reach out and talk to individuals about MACC programs. The promotion generated 1,661 total entries and 730 email opt-ins for MACC. Contact us to start your online promotion!